Selarang Camp & Barracks Changi. Returned from Thailand to Sime Road Camp, Changi Gaol Camp. Kanu II Malayan Hamlet, Kanu IIIa (Tampie North), Kanchanaburi. Read about Alby at Malayan Hamlet Camp. Albert’s parents Thomas Miller and Eliza Brannie were born in Cumberland England and married there in 1900. The couple had 5 children when they migrated to Western Australia after 1911 and before Albert was born in Collie in 1913. Albert was the first of 4 sons born in Collie, Western Australia making a total of 9 children including 2 daughters. 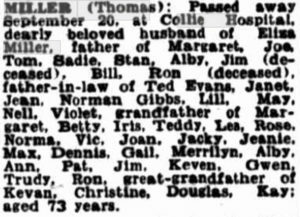 Alby married in 1939 at Northam to Violet May Baker. 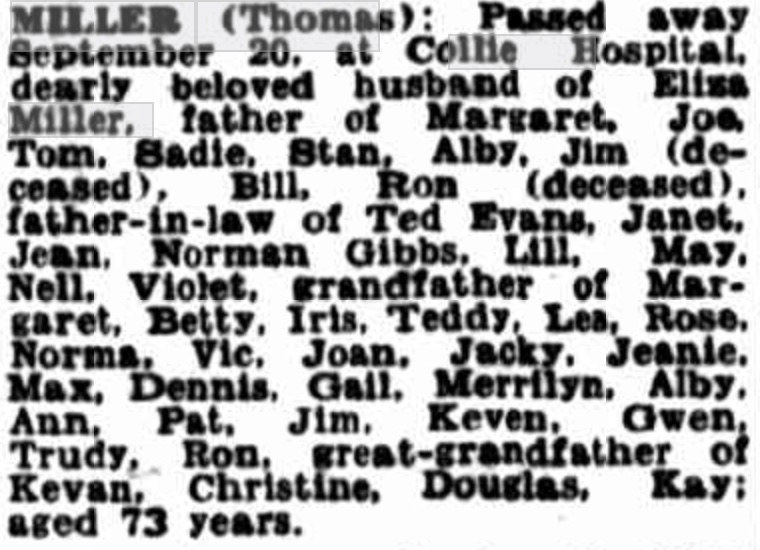 Violet was born in Kalgoorlie in 1917 and twin to Phyllis Lorraine Baker who married Paul William Nbyo in 1937 East Coolgardie, twin brother to Chris Nybo and brothers of WX143277 Lawrance (Roy) Nybo from 2/4th who died in Thailand 1943. Alby’s father died in 1950. Alby was one of the Collie boys who survived and returned home. Please read further about Collie. Alby died January 1985 at Jurien Bay. Violet died in 2003.